In the aftermath of the Civil War, Hope College was founded near the Lake Michigan shores in Holland. Never in the college’s 150-year history did it ever have a venue devoted entirely to music – until the opening of the Jack H. Miller Center for Musical Arts. The Grand Rapids Symphony capped off the Miller Center’s inaugural year with an appearance in May. Named for benefactor Jack H. Miller, the 800-seat auditorium opened last fall. 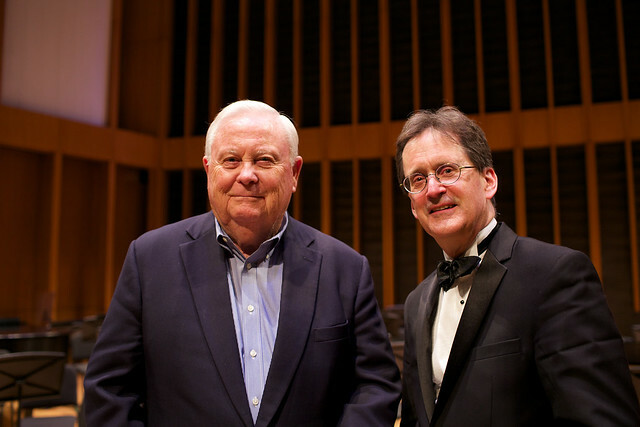 “This is the house that Jack built,” said Grand Rapids Symphony’s Associate Conductor John Varineau at the concert on May 20 with Miller in attendance. The house includes a three-manual, 54-rank pipe organ that makes the Miller Center’s auditorium the largest concert hall in West Michigan featuring a permanently installed organ. The Grand Rapids Symphony put the “King of Instruments” in the spotlight for a special Musical Arts Celebration featuring Hope College organist Huw Lewis playing the new Casavant Brothers pipe organ. The 64,000-square foot Miller Center for Musical Arts, which opened in October 2015, was a $35 million project including the costs of construction plus an endowment to provide for its maintenance. A 1954 graduate of Hope College, Jack H. Miller retired in 2002 after 48 years at the helm of the Howard Miller Company, which was founded by his father, Howard C. Miller, in 1926. The former member of the Grand Rapids Symphony’s board of directors continues as an honorary member of the board. Lewis, who has appeared many times with the Grand Rapids Symphony, was soloist in the second movement of Camille Saint-Saens’ Organ Symphony No. 3, a piece heard in the movie, Babe. Lewis also played Invocation and Dance for organ and strings by contemporary composer Alfred Fedak, a 1975 graduate of Hope College. The program, which opened with Beethoven’s Leonore Overture No. 3, included the third and fourth movement from Tchaikovsky’s Serenade for Strings and Dvorak’s Carnival Overture. Grand Rapids Symphony principal cellist Alicia Eppinga was soloist in a portion of a Cello Concerto by early 18th century Italian composer Leonardo Leo. Varineau said the opening of the new Miller Center was a milestone, not only for Hope College, but for all of Holland as well. “Beyond the walls of Hope College, Holland, Michigan, has always had a heart for the arts. You walk down Main Street and there are all these sculptures. We know that Holland is up on the arts,” Varineau said.